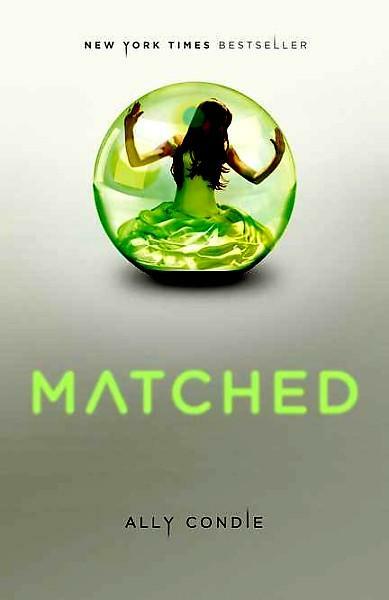 Matched is the first in a trilogy of dystopian YA fiction by Ally Condie that I’ve heard so much about on the web I had to read it for myself. It’s good enough that I want to finish the trilogy, but at the same time, it doesn’t feel very original. Maybe I’m just burning out on the dystopian genre. After seven or eight of them, the themes all start sounding the same. This one, like all the others I’ve read, involves a domineering futuristic government, lots of rules, capitalized terminology unique to the setting, little freedom, and a main character who rebels. I really enjoyed the The Hunger Games trilogy, by Susanne Collins, and I liked the Divergent trilogy (so far) by Veronica Roth, but maybe that’s because they were my first YA dystopian experiences. And of course there’s the middle grade Giver trilogy that I reread this year which I still like. But I’m starting to see a pattern. It took some of the glitter out of this series. Matched opens on Cassia’s seventeen birthday. She’s on her way to her Matching Ceremony in which the Society chooses her future mate. Curiously, impossibly, she’s paired with her best friend, Xander, who traveled to the ceremony with her. But later, when she inserts her microcard into the port to read the data on Xander, his face fades out and another boy she knows, Ky Markham, shows up on the screen as her match. What happened? The Society never makes mistakes like this. The power of suggestion proves too much for Cassia. She’s now intrigued by Ky and his mysterious background and his label as an Aberration. She finds herself falling in love with him, and he with her despite the danger of defying the Society. And that’s basically the whole plot of the book. The way she drops her dear friend and goes chasing after Ky was a little too much for me. The whole thing felt contrived. But Ms. Condie does have a beautiful writing style, and she creates circumstances intriguing enough that I do want to read the next book of the series. Because there was more to the “mistake” than Cassia thought. A lot more. For example, a border war the general population knows nothing about. But the astute ones like Xander, like Ky, like Cassia’s father see the signs. The facade the Society puts forth, the perfection and safety, is starting to crumble. And now Ky has been sent to the front lines.